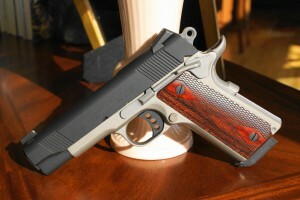 I was asked about my ideal 1911 Configuration… The Ogre Edition 1911, if you will. My dream 1911. It’s really simple. We’re going to start with a Lightweight Commander platform, give it a Beavertail and a Commander style hammer. The rear sight will be neither a GI or a Novak, and it wont be adjustable. It has to be able to facilitate one hand slide-racking in an emergency. 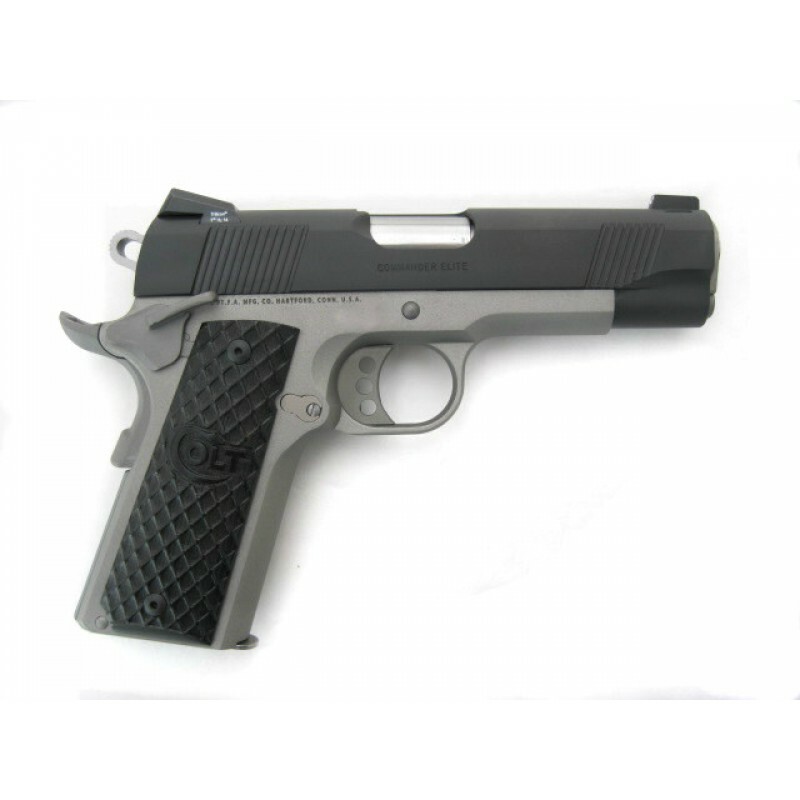 And it’s going to have the “Bobtail” conversion not just for looks, but for feel and concealability. 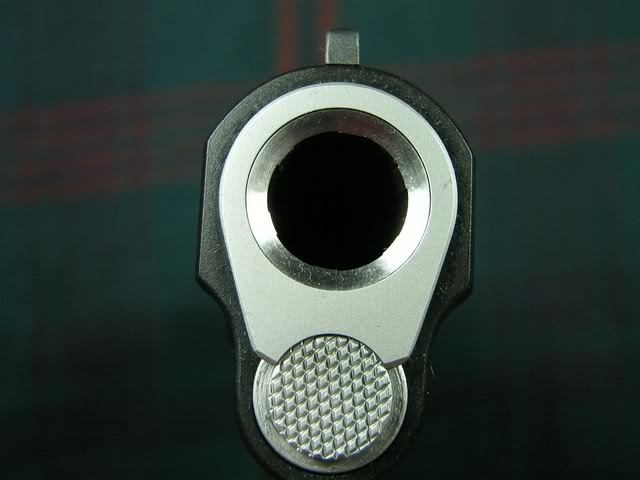 The Muzzle end will have a deep target crown and will be flush with the bushing. Also note, it’s going to have a Bushing and a GI style spring plug. 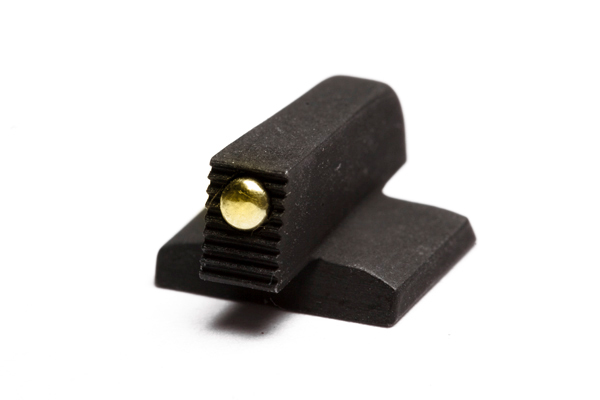 The front sight will have either a Trijicon HD, Big Dot, or Gold Dot front sight post for MAX Visibility. NO FIBER OPTIC. The rear will be nice wide notch, sans the 2 rear dots. I don’t like double dot rears. The overall gun will be slightly “Melted” to soften any hard edges. Serrations will be simple GI style, with nothing forward. 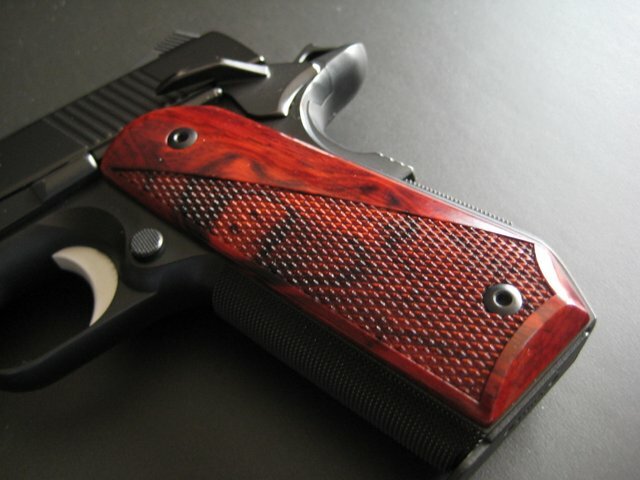 The grips will be rich Cocobolo wood, thin, and low profile, edges slightly rounded. The front strap of the grip frame will be 30LPI checkered. The gun can either be all black, or black over a light colored frame. The Caliber will be 10mm. 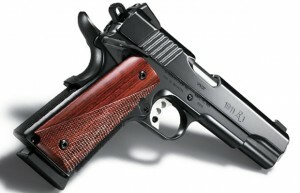 This is my ideal 1911. Though no one as of yet makes it. 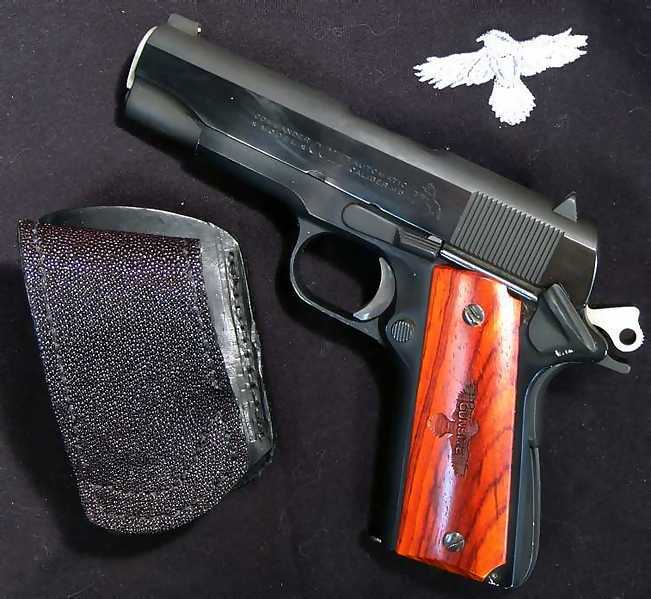 The Ultimate 1911 for EDC (Every Day Carry) has got to be the classic Light Weight Commander. Those simple wood grips, with the simple blacked out finish… No Ramp rear sight… This is an example of LW Commander Perfection. It doesn’t get any better than this. 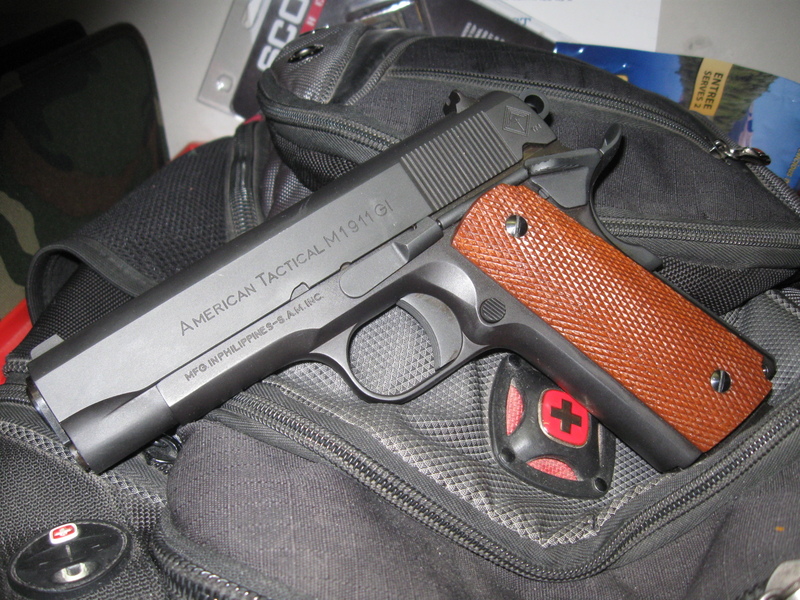 To me, this is the just the ideal 1911, period. It’s the most flexible, capable 1911 you can get. When you step away from this pattern, you step into more specialized, more limited areas. 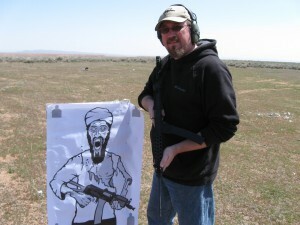 You can easily rock an LW Commander in an IDPA match, and win it. You can easily take that same gun and wear it for week concealed. You go to a 5″ Government if you like. And that’s fine. But packing it concealed every day gets to be tedious. Especially if you are getting in and out of vehicles all week. You can go shorter than 4″ if you like… makes packing it much easier, sure. But you sacrifice reliability in a way that I just find to be unacceptable. Maybe you don’t need a reliable sidearm. Huh… Well, someone is buying Kimber Ultras. No… to me, the LW Commander just has it all. The question though is WHICH light weight Commander. Ruger is all over the place with their new LW Commander. No, it’s not that I’ve been a Ruger Fan Boy lately, it’s just that Ruger is really “Doing It Right” lately. (Granted – their new “Custom” LCP should be an LC9S, but that’s another topic) I really like what Ruger has been doing lately. 5 years ago – I may have had to hurt you should you have suggested that I’d be saying that. But it’s true. Ruger is making some fine products, and their 1911’s are getting better. If anything, they are really worth taking a look at. 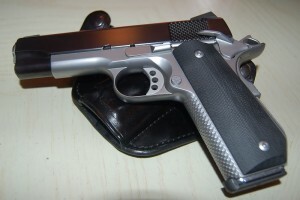 I have handled the R1 Carry Commander again… This time taking a good hard critical look at it. Dang if I can’t find a fault in it. The action is super smooth, not too tight, not too loose – it’s totally Goldilocks. 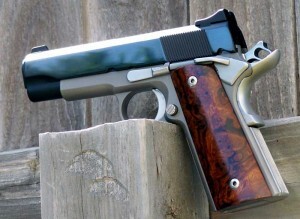 This is just about the most flawless Commander I’ve seen for production 1911’s. The finish inside was excellent. I’m impressed, Remington. Very impressed. This gun is a contender for the next 1911 I get. It really is. If you get a chance to look at one at your local gun seller – take a good look at it and tell me what you think. A Lightweight Commander. Specifically a two tone LW Commander. As far as pistols go – these are my Redheads. My Kryponite. My weakness. This one is very nice… Subdued colors. A big visible dot on the front sight… Very nice indeed. I’m not a huge fan of the ramped rear sight, but I can deal with that. On this gun the higher end red wood grips are a little dressy on the flat finished gun. This one is nice too… Subdued colors again, but with a set of black grip panels. I like that a bit better due to the fact that it’s more in keeping with the motif. The first one is like having White Wall tires on a Mustang GT. I guess that would be fine if that’s your thing… it’s just not my thing. And if it is your thing… and you like that… Well, “America”. Bully for you! Here’s one that’s very good. Micarta grips, brushed stainless and a moderate polish on the slide… Not Subdued, but more natural. I really like that. I also like the Bobtail… a lot. But it’s not necessary… Just really really nice. Like Navigation or a Back Up Camera, or XM Radio. Oh man… Here we go. This is the higher end. 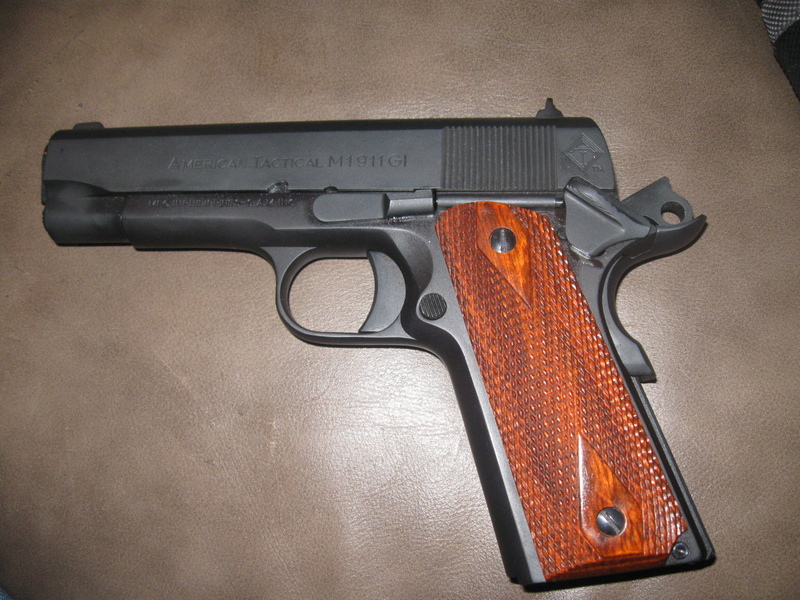 We have a high polish on that blued slide and burled walnut grips. This one is so nice that it’s almost too nice. We call guns like this “BBQ Guns”, but it’s what you wear to a BBQ at your friends place… your nicest gun in a nice leather holster. Not something I’d EDC, but wear to special occasions. It would be like having a date with a Super Model… You are not going to take her out on the rounds of your usual haunts, but to some place special. (Unless she asked to go to the regular haunts mind you) So for me, that last one there, the more natural one, that’s the one I’d pick. What do all these Commanders have in common? Two Tone Finishes, with Dark on top of Light. The current Vogue due to the advent of stainless slides on polymer frames is to have a light colored slide on a dark frame. This I don’t care for. It makes all manner of sense though, sure. It’s PRACTICAL. A stainless slide will show less wear than a blued slide. And frames will typically show less wear than slides… So putting a stainless slide on that black frame makes Reason and Logic smile. But it doesn’t make me necessarily smile, no, just the opposite is true. And let me tell you why. Growing up reading every gun magazine I could get my hands on as a kid, I stared with wide eyes and great wonder at the custom 1911’s made by true master level gunsmiths… and all of them were two tones with stainless frames and high polished blued slides. That LOOK defined “Custom” for me then and it does so now. So the stainless slides on black frames just look “off” to me. So my ultimate has to have a black slide on light frame. That just visually tastes right to me. The nice wood double diamond grips were just too nice for the ATI. They didn’t go well with the matte black finish. After awhile it got to the point that I found them just irritating. So I got some nice plain old Hogue grip panels in OD green. The matte finish on the Hogue work very well, keeping the ATI in a nice subdued scheme. Makes me want to Duracoat the Slide OD.G as well. The gun is north of 600 rounds now, with only one fail to feed. Again, that failure to feed was in the first few rounds right after I got the gun, and it has never happened since. I did replace the recoil spring after those first few rounds, because the gun did feel under-sprung. The gun has been perfectly reliable since. The gun shoots point of aim/point of impact at 30 feet or so… I’ve had no complaints about accuracy, only compliments from everyone that has shot it. I’ve let a few people shoot it and no one has had a negative bit of feedback, and no one has reported any malfs. The biggest question about the ATI is the quality of the steel. So far, there has been no unusual wear on any of the internals. So I am thinking, so far, that the steel is up to snuff. I have no reason to suspect that its a lesser quality steel alloy. I don’t think it’s anything great or special… but it doesn’t look bad at all. The only real wear the gun is showing is on the finish, which looked suspect right from the beginning. If you look at that photo closely, look at the muzzle end, you can see the wear. 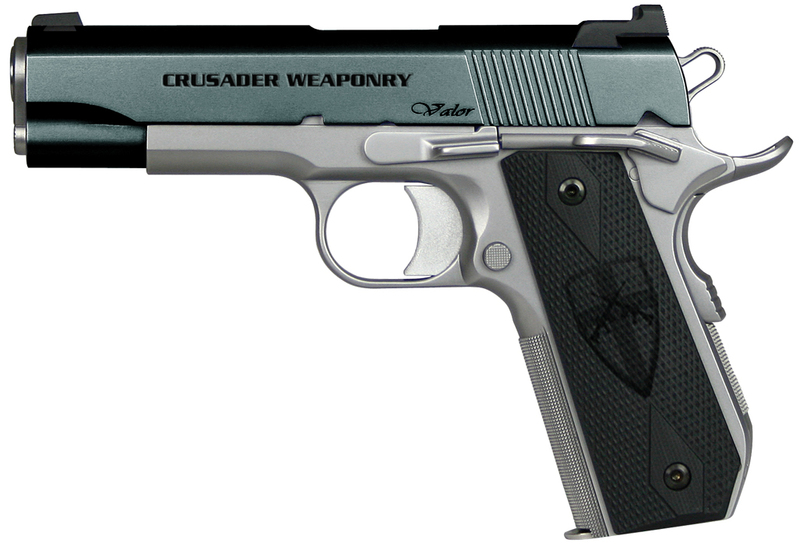 I’ll have Joe at Crusader Weaponry give this thing a Duracoat treatment, and that will take care of the finish – no problem. It’s a 450 dollar 1911, so you do have to cut it some slack. And finish that shows holster wear only makes it looks like you actually use the thing… I think a gun with some holster wear looks better than a gun that looks like it’s a Safe Queen. But that’s just me. Commander, Sterling, and a P-11. I don’t have much gasoline in the truck, and I’m so broke I can’t afford to pay attention. But I have ammo and Ballistic Testing Zone One is practically out the back door of Ogre Ranch. So we did a little bit of shooting while the kids were doing school work. Group is good for 50 yards iron sighted, standing. I'll take that. Looks better than I imagined it! Thanks Daniel for brining my imagination to a visual. THAT is my PERFECT 1911. I’m in love. 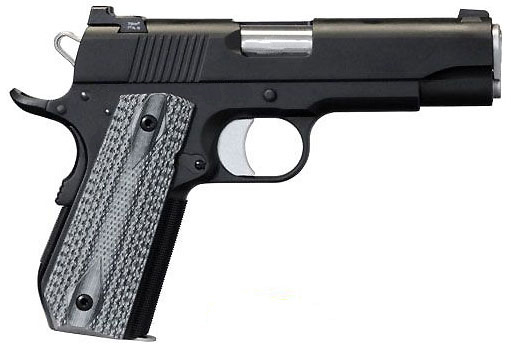 I’ve been thinking about what a Crusader Ogre Edition 1911 would be. I don’t have any photoshop skills, so I can’t do up a picture to show you. But let me paint the picture for you in the mind. A stainless Dan Wesson V-Bob, a Commander length… with a blued carbon steel slide, and a muzzle treatment like a Nighthawk T3, and Straight 8 night sights. Done. Simple. Oh, and it would be a 10mm. Nice rosewood double diamonds, with some character. I sold a 1911 to a fellow who wanted to install a set of Crimson Trace Grips. So that’s what I did. I offered 10 bucks to the fellow for his “old” grips. He took me up on it. So now my ATI Commander has a decent set of wood grips. Looks much nicer… what do you think? 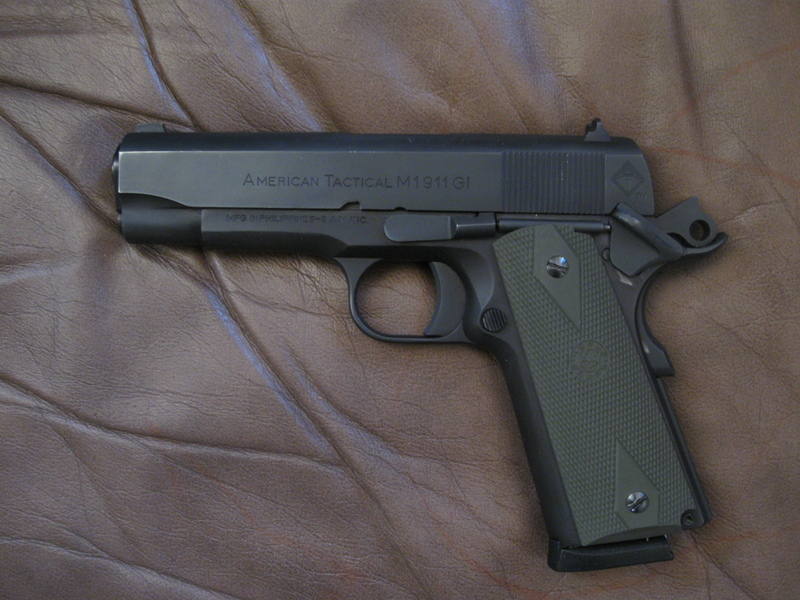 A Commander 1911 .45... My biggest weakness. Also, the old grips were squared off at the bottom and the new ones have a nice beveled touch to it. Much much better. ATI 1911, I had no choice. 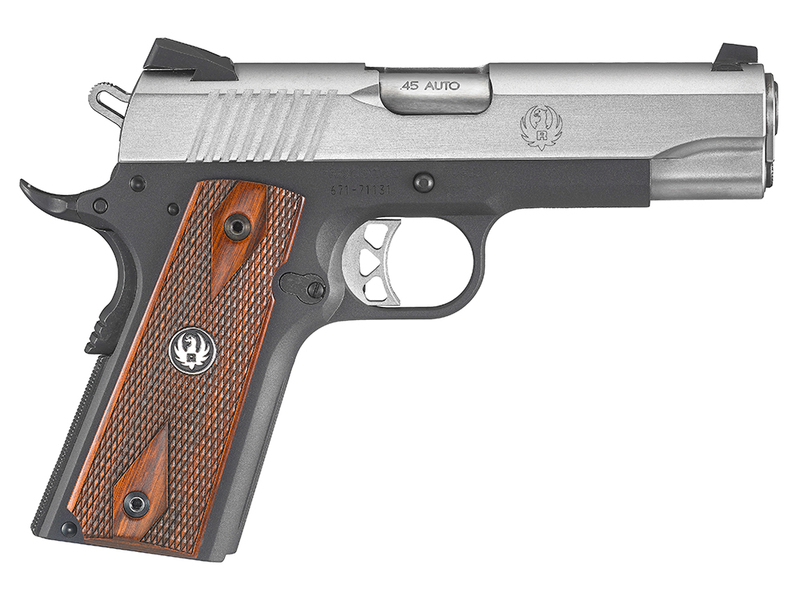 ATI is bringing in some really well made 1911’s. I’ve been eyeballing this Commander for almost 5 months now. Had to do it… I… can’t… help… myself. I’m an addict… I know. I have a problem. I admit it. I LOVE guns. 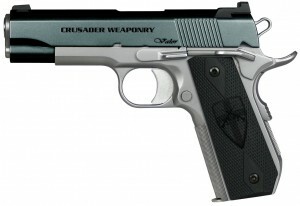 Crusader Weaponry list of soon to be done upgrades: Full ST-1 Treatment. Trigger Job, Action Job, and an OD Green Duracoat on the grip frame. Then those nasty wood grips are getting replaced with something else… I don’t care what.